I spoke at the AppNexus Summit a couple of weeks ago. Brian O’Kelley read my post on adtech investing trends and asked if I could expand during the session. The video is online (my part at 1:48), but I thought I’d write it up also. I figured in the AppNexus audience of 600 that there was quite a bit of overlap with the few thousand people who read the post. Because, really, who else would read it? So I didn’t want to just talk about the post. I started from a couple of the slides and went into what it means for us, adtech entrepreneurs and investors. These, to me, are the two key charts in the previous post. The first shows that VC investment in adtech companies is down. 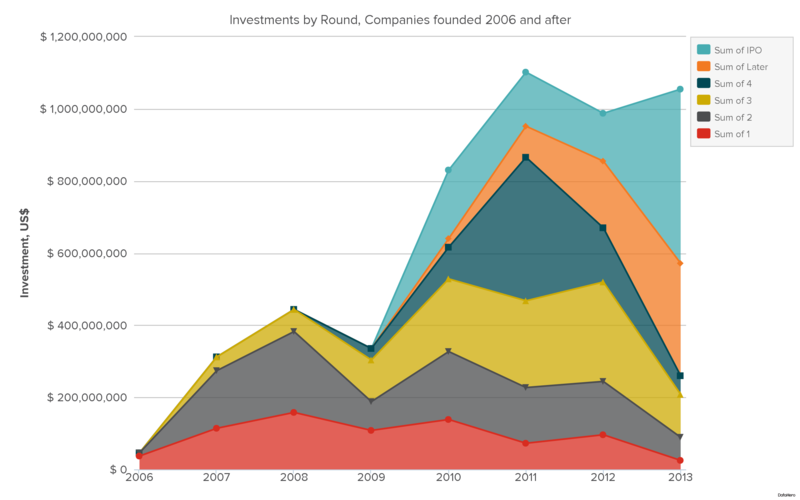 The second shows that, even more alarmingly, the number of companies founded is way down. Now these numbers are from Crunchbase, so they are skewed, incomplete, and there is an evident selection bias. And, of course, I chose which companies were considered adtech and which were not, so there’s that. 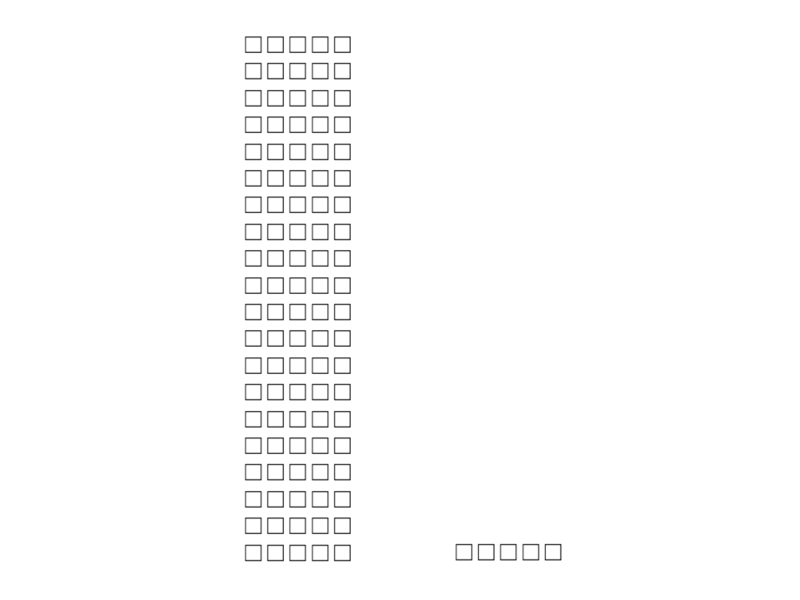 But everyone I showed the second chart to disputed it. They were all certain that more companies than Crunchbase was showing had been founded in 2013. And, if you think about it, it’s pretty odd. The programmatic industry has finally attained widespread acceptance. It is now an accepted part of the media-buying landscape. Nobody asks why you’re buying programmatic anymore, now they ask why you’re not. And you better have a pretty well thought-out reason. We’re finally at Step 3: Profit and company formation seems to have died. Common sense would suggest there would be a lot of startups, where are they? So, on the one hand, you have a ton of companies being started in adtech, according to AngelList. And on the other, you have only a handful, according to Crunchbase. I think the answer is actually in the Crunchbase bias: Crunchbase is far more likely to notice a company if it is funded by a VC or well-known angel and is covered by the media. The small number of companies on Crunchbase is a measure of VC pessimism. AngelList allows founders (and would-be founders) to list their ideas themselves. The large number of companies on AngelList shows founder optimism. So now we have to ask: why the gap? Why, if entrepreneurs see a market opportunity enormous enough to throw everything else aside and devote themselves to it, are VCs shrugging their shoulders? I may well be the most prolific adtech startup person of all time. Between my time at Omnicom, starting an adtech company myself, advising both buyers and sellers of adtech companies, and doing more adtech rounds in the last five years than any other angel, I’ve been involved in more adtech financings than anyone else I can think of. So this may be the appropriate time to interject that I have not added an adtech company to my portfolio in two and a half years. I know why there’s a gap, I’m part of it. The purpose of the talk is not an investigation of the gap, but an apologia for it. I am an adtech believer. If you’re reading this, you probably already know that. I’m a believer because–at the risk of sounding grandiose–I think the programmatic innovations have the hallmark of being a technological revolution. The hallmark of a technological revolution is a technological system–a set of interlocking innovations–that creates lasting and important change. Is RTB lasting and important? Of course it is. I’ve argued this elsewhere, and I am probably singing to the choir here, so I won’t belabor it. 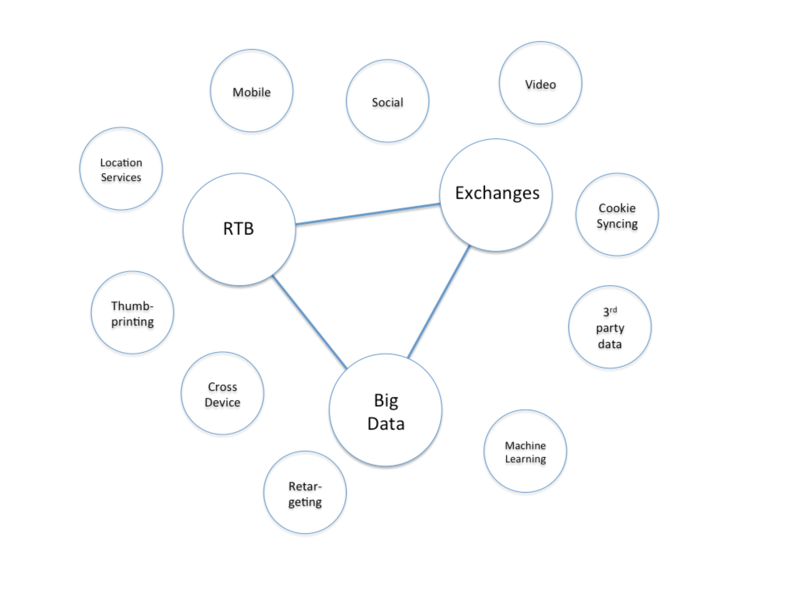 The main technological systems that allowed the programmatic revolution were the exchanges, big data, and RTB. These were augmented by ancillary innovations, as below. 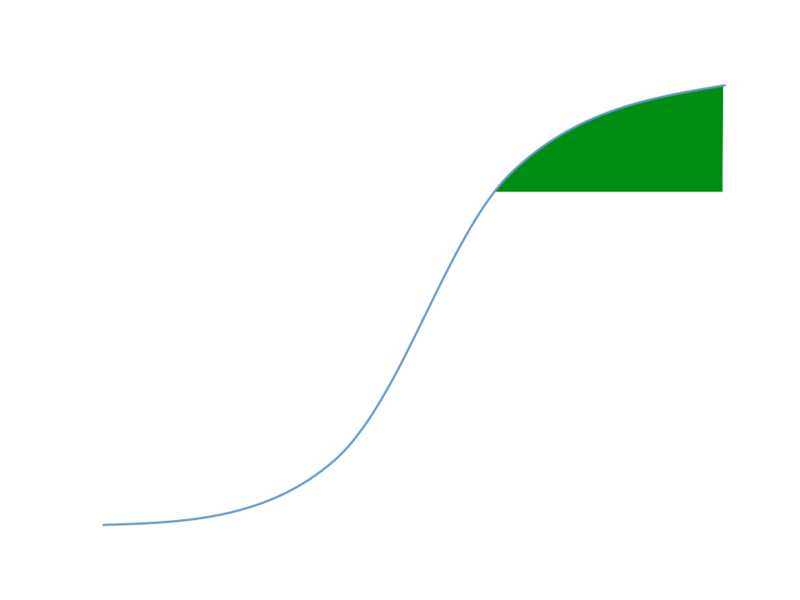 And, as these things overcome initial market resistance to change, and the innovations reinforce each other, the familiar up-and-to-the-right curve appears. Beloved of entrepreneurs and investors alike, this is the optimism. 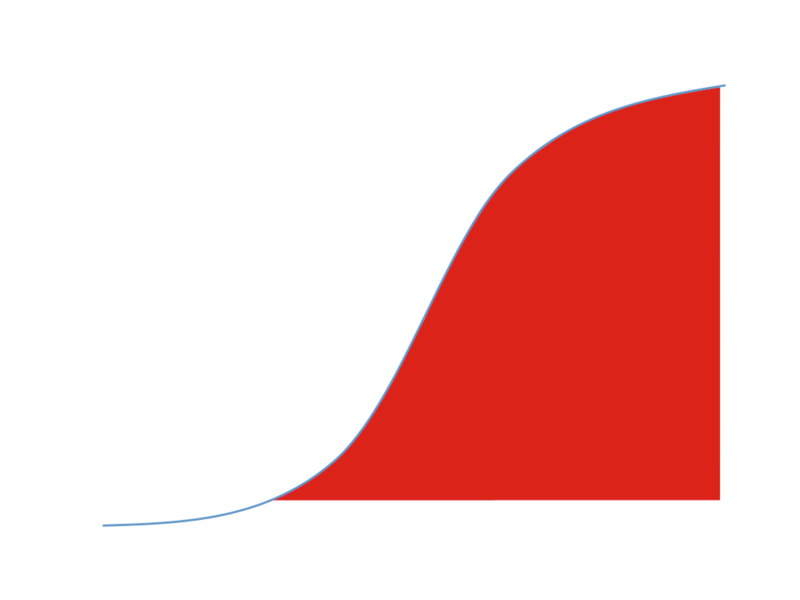 Of course, what the pitch-decks never show you is the rest of the curve. The innovation spurred by any technological revolution can’t last forever. Once the largest and most radical innovations are out there, it’s a race to discover and commercialize the most promising ancillary innovations. At some point the innovation space starts to become exhausted and the newest new things provide less benefits to the users. When this happens, users insist that new innovations fit into their schema, not a new schema being pushed by the entrepreneur. 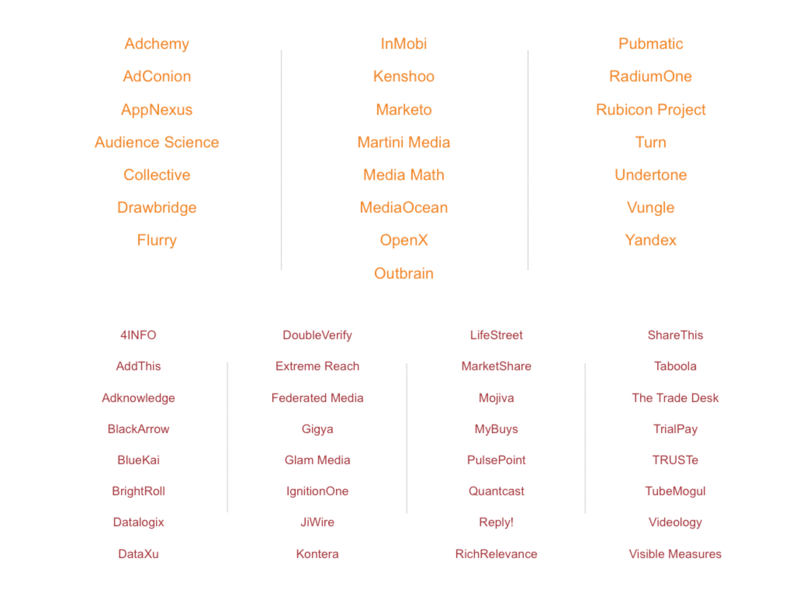 Now, in adtech, we have a lot of buckets. Right now, if you have something new, you need to fit into an existing bucket. And if you are in an existing bucket, you need to be better than what is already there, probably a lot better. 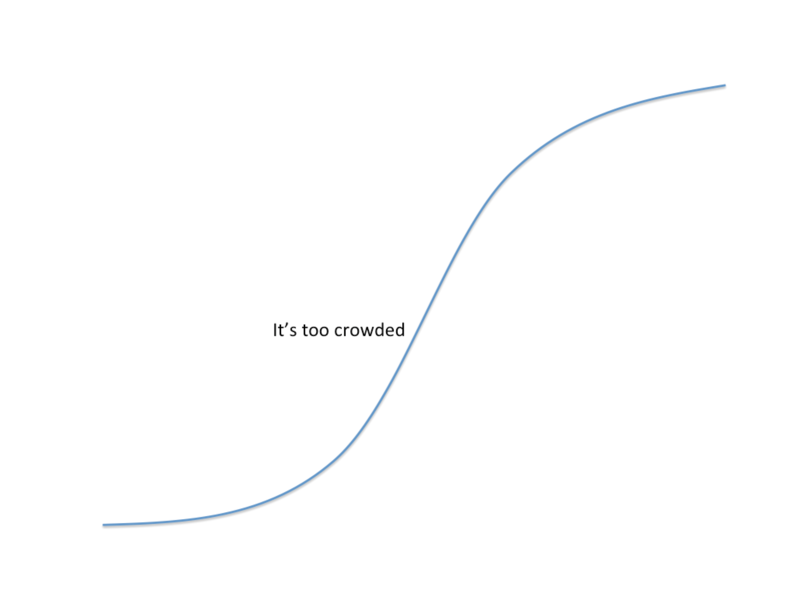 When this happens, when customers won’t accept anything except the kind of innovation that makes existing products perform better–incremental innovation–you are pretty far along the S-curve. Venture capitalists, meanwhile, are thinking not about how big the market is today, or even how big the market will be tomorrow. They are thinking about how much growth the innovation they are backing might drive–how much innovation is left in the market they are investing in. They weigh that against risk. Early-stage investors look at the world like this first chart: there is a lot of potential value to be garnered, but also a lot of risk. VCs with a bit more sanity wait for the market to be proved out a bit. They have less potential upside, but much less risk. But VCs are generally not interested in a market where there’s not much innovation left, even though there may be lower risk. Low risk, low reward investments are not what VCs do. You might dispute that we are late on this curve. And it is certainly true that big innovations can be found late in the cycle, it’s just more unlikely. And more than unlikely, whether a radical innovation will be accepted by the market is unknowable, so the entrepreneurial team needs to be able to explore the market-space they have staked out. If the initial idea is not viable, and exploration is unlikely to find a new one, it’s hard to invest. The pace of innovation is generally pretty obvious from the outside. It can be hard to see when you’re in the middle of it. The typical objections investors have to companies started in different parts of the cycle are a good tell. When we were first raising money for Root Markets almost ten years ago, VCs consistently pointed out that no market existed for what we were building. We pointed out that we were building that market, but that just elicited smug cynicism and disdainful dismissals. Later in the cycle, the excuse is that the market is too crowded. Michael Walrath, the founder of Right Media, in a video interview a few years ago, said that he doesn’t invest in adtech companies, it’s too easy to build one. 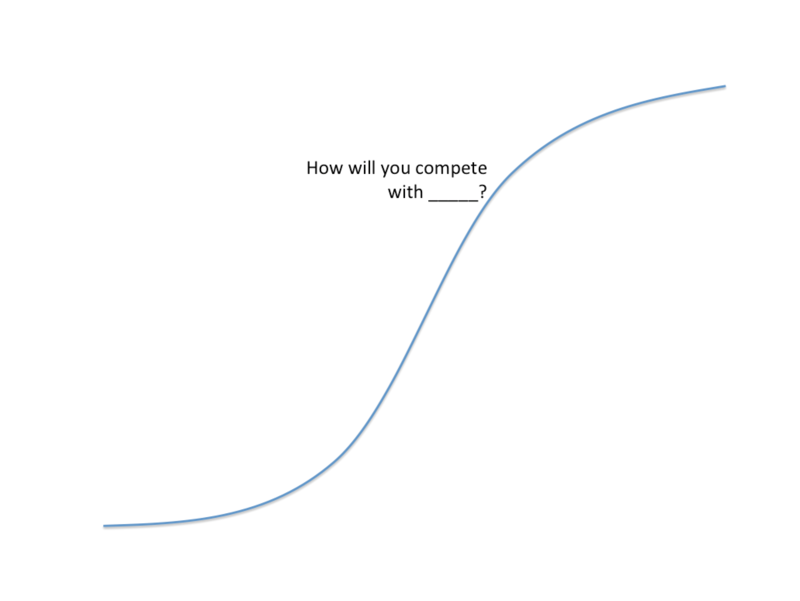 Of course, the problem is not that it’s easy to build a company, the problem is that since it’s easy, too many people have or will build competitors. So what do you do if you are an entrepreneur in adtech? If you have a company that is not one of the top three in your bucket or is not in any of the buckets? 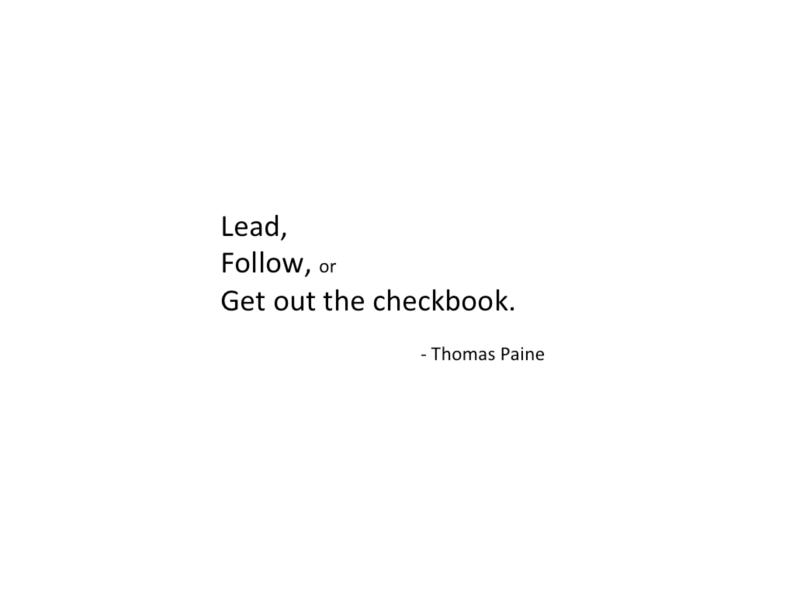 The three obvious solutions are: lead, follow, or get out your checkbook, as Tom Paine said. Leading in this market is going public. We’ve had a couple of great adtech IPOs this year and when Wall Street comes back from the holidays, we’ll see a few more. I made a list, from publicly available data, of companies that–either from press reports or from the patterns evident in their funding and growth numbers–are ready (or their last investors believed when they invested they would be ready) to go public. Just to caveat this list: it is from public data. I have private data that says that several of these companies are, in fact, raising rounds right now, that a couple of them are already in private registration, and that a couple are actively making themselves available for sale. But that’s private info, not mine to share, so I used an objective outsider’s process to make this list. Not all of these companies are lined up to IPO (and there are some that are not on the list.) But the list is long enough to say that, markets willing, there will be a few adtech IPOs next year. And this is good. Because that little green wedge up a few paragraphs? 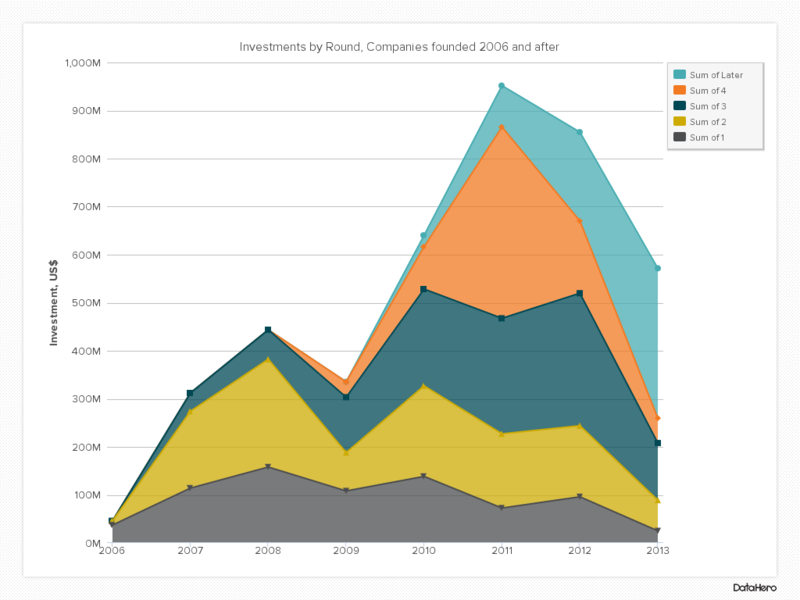 The lower risk, lower return one that VCs are not interested in but is where we are today? That’s the one public markets investors are interested in. If you layer in money raised by adtech companies in the public markets to the very first chart in this post, it doesn’t look like adtech funding is slowing. In fact, it’s just moved away from VCs to the public markets. So that’s option one. Option two is follow, and that means be acquired. We’ve been talking about consolidation in the adtech space for years now. It makes rational sense for there to be fewer companies, fewer point solutions. Customers would appreciate having fewer touch points into RTB and not having to do any integration themselves. And to put an even finer point on the “just because consolidation should happen doesn’t mean it will,” let’s look at consolidation in the last adtech wave, ad networks. 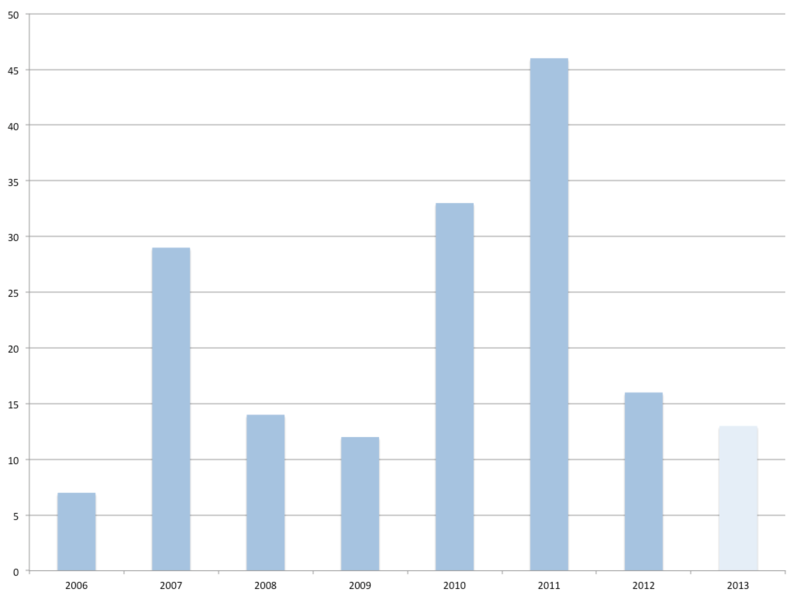 Here’s a chart of data I have from 2007 on ad network reach. 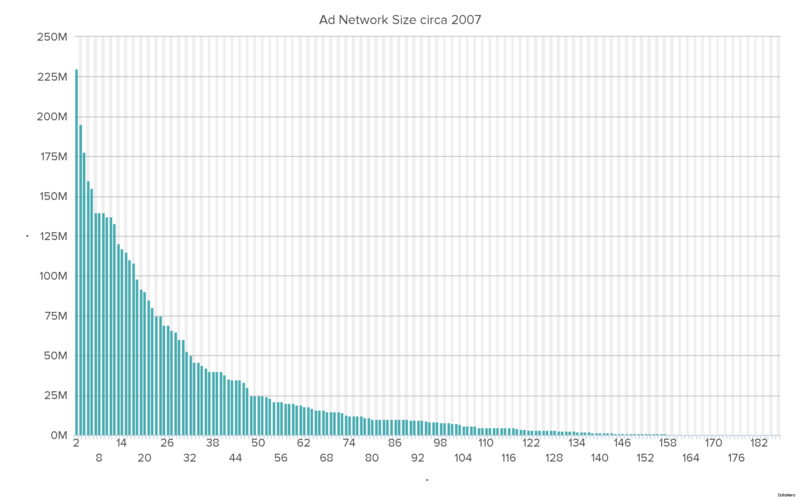 Well after the end of ad network innovation there were still several hundred ad networks. All but the top few were at a significant disadvantage in the marketplace, but they still existed. Customers would have preferred fewer, and both the big ad nets and the small ad nets would have preferred a less noisy market. But consolidation still did not happen. Consolidation is not inevitable. The third way to go is to buy your way into getting big fast. I’m not going to name names, because I figure I’ll piss off enough people with this post already, but there are companies that have raised big rounds based entirely on VCs looking at the existing size of market and a team of experienced people. 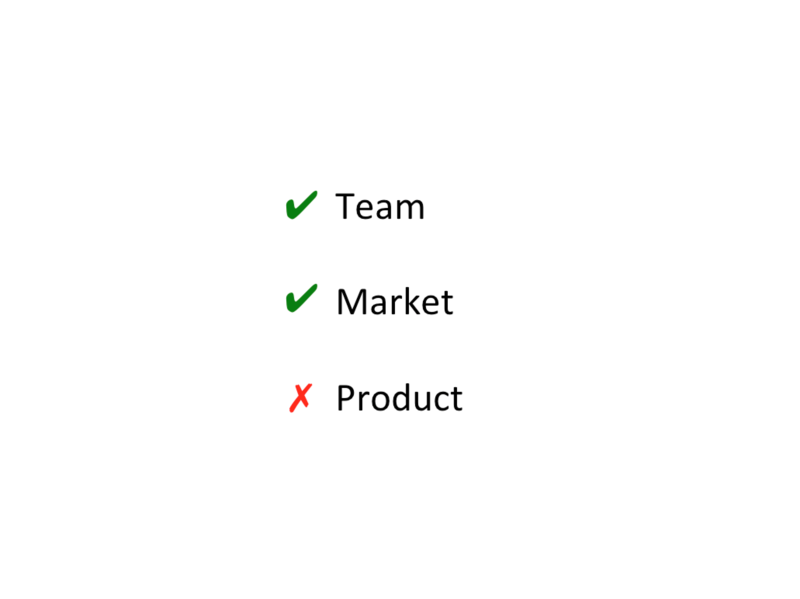 They figure that if the people are good and the market is big and the existing companies in the market are run by new entrepreneurs or have products of marginal quality, they can build a better (or equivalent) product and simply outcompete the incumbents. Back in the late ’90s, some of my portfolio companies–Razorfish, Agency.com, Organic–went public and garnered multi-billion dollar market caps. Companies like Scient and Viant were formed with management teams from established consultancies and raised large private rounds under the assumption that the experienced team could build a better business very quickly by spending money on hiring and selling to clients. While cynical, this sometimes works. I expect it to happen more in the near future. So, those are three options. The problem with those options is that if you have one of them, you almost certainly already know it. If you are able to IPO, or you have suitors knocking on your door to acquire you, or if the people who can write $50 million checks like the cut of your jib, you already know that. If you don’t think you have one of these options, you probably don’t. Then what? 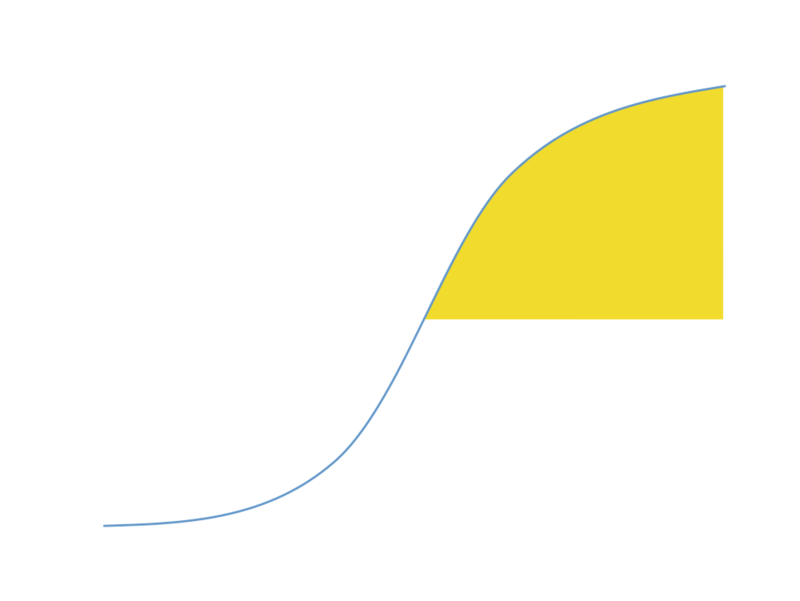 The way innovation works, each S-curve is preceded and followed by another. 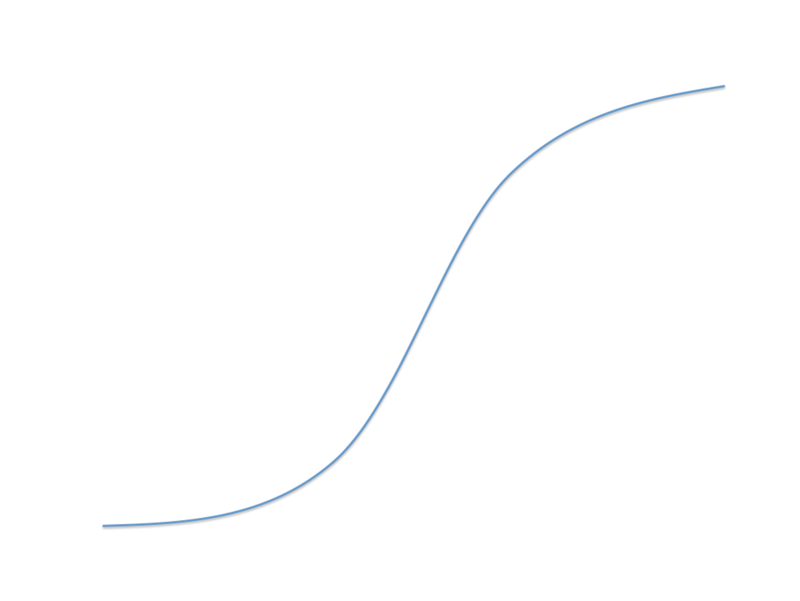 If, in the below, programmatic is the middle S-curve and ad nets were the left-bottom S-curve, there is another S-curve waiting in the wings. Right Media, which could arguably be said to have kicked off the growth of the middle S-curve, was originally an ad net. When that didn’t work, they looked around for some other way of having an impact and started their exchange. And remember, this was when ad nets were still the big thing in adtech. Programmatic is the big thing in adtech now. 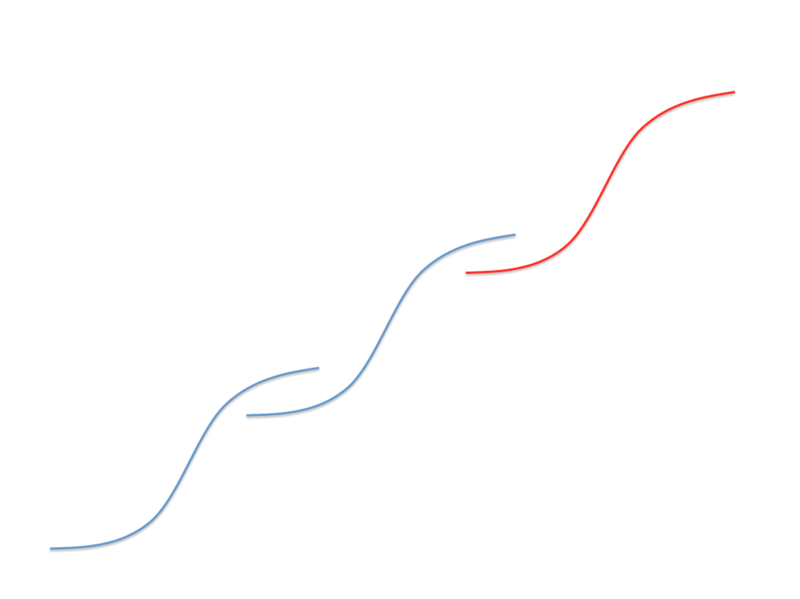 Perhaps we are at the same place in the programmatic S-curve that ad nets were when Right Media started. If so, you should expect that there is some company out there right now or will be in the near future–probably viewed with the same opprobrium that Right Media was in 2004–that has started the next S-curve on its way. Being that company is now an option. Investors that have given up on programmatic because it’s too late in the cycle are itching for that company to appear so they can put their money to work. I know I am. If you have none of options one to three, being the radical innovator needs to be your option. It’s all that’s left. I got some applause when I was done speaking, but I assume that was from the people who weren’t listening. I mean for this to be a wake-up call. Starting more companies like the ones that were acquired in the near past is a fool’s game. If you want to win, you can’t just go out and do the same thing but better. You need to do something different. I tried very hard not to digress in the talk, despite digressing being one of my favorite hobbies. 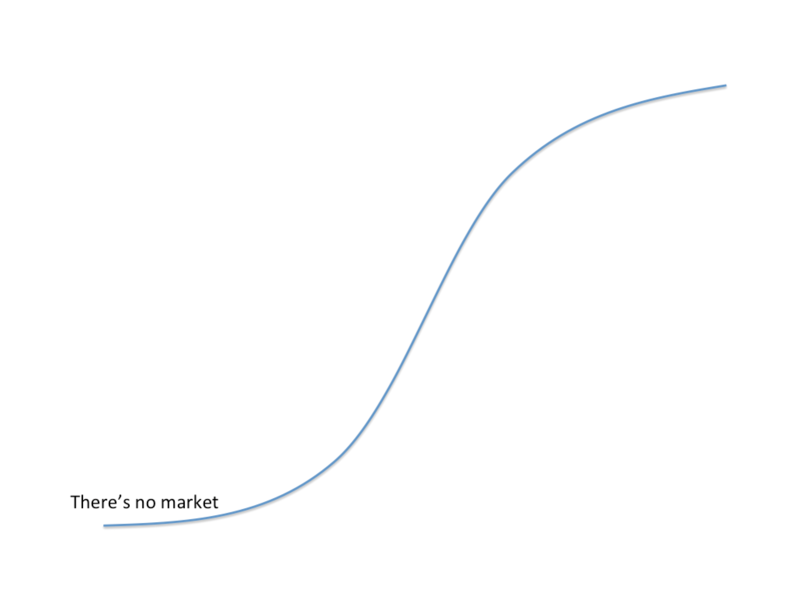 So I didn’t use this slide, because it was simply the sad social commentary on how easy it is to appear smart and how many ignorant plaudits one can win by pretending to predict or recommend something that the market as a whole has already realized and implemented. I repeat this caveat so often it should have an identifier. I shall refer to it henceforth as Caveat CB-1. My personal challenge in this slide deck was to communicate only with pictures. I did not succeed, but I did pretty well, if I do say so myself. When I told Noelle that this was my aim, she rolled her eyes. And, at the further risk of sounding… well, being pretentious, I suppose, since I am mere laity in the academic world… this is the language of the neo-Schumpeterian innovation theorists. This is not, in fact, a good reason not to invest. But if you do the management team needs to be top-notch at marketing, selling, and operations and not necessarily top-notch engineers. I personally like to invest in companies where the technology is really difficult to build and understand, but that’s because I feel like I have an advantage over other investors when that’s the case, not that the company is always a better investment. A cursory review of the successful ‘technology’ companies of the last twenty years will quickly show that both ways have worked. It wasn’t the first, certainly. I remember trying to get into a round in the late ’90s of a company called AdAuction that was trying to build an ad exchange. I did not get in the round, luckily, because it was way too early; the other pieces were not in place, and the existing wave had not run out of net valuable innovation. 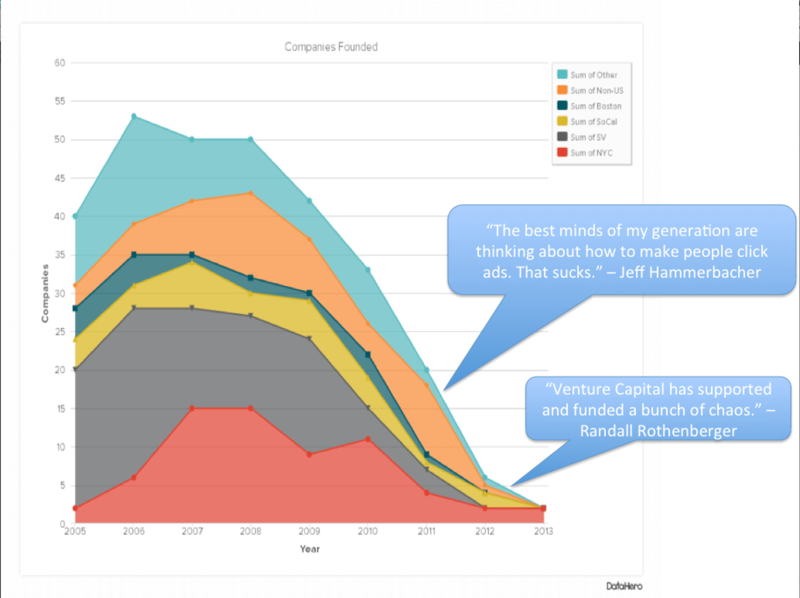 Jerry, great empirical synthesis of the investment environment the ad tech community currently faces. To your point, the question is whether the investor shift to late-stage investments suggests that innovation in the space is over. From one perspective, I’d argue yes. We may be at diminishing returns for point solutions that incrementally create, improve or replace one-off market activities by reducing cost 10X or improving experience 10X. This stage of point solutions has lasted for 15+ years – and will continue in some form for a good while – largely because the underlying business function it’s addressing – marketing – is inherently fragmented (and further fragmenting) and inherently possesses a less mature and sequential process than, say, manufacturing, sales, or accounting functions (whose technology systems are highly consolidated). Marketing is not sequential; it’s interactive, it’s stimulus-response, it’s “try this, try that”. And, equally important, it’s effect on consumers and customers is, in many ways, sociological, ethereal, and unmeasurable. For ad tech to evolve into a true enterprise application category – ERP, SCM, CRM, etc., the function itself (read: CEOs and CMOs) must acknowledge and define a steady-state marketing process that ad tech can clearly map into. Migrating from cool media buying technologies into full-fledged enterprise applications is the next, big, hairy problem for ad tech – one that many ad tech technologists will struggle to address. It’s not about that next technology innovation; it will root back to core disciplines of marketing strategy, multi-channel attribution, end-to-end marketing operations, integrating sales and distribution, customer acquisition and loyalty, and fundamental insight to brand development. Not your father’s ad tech. Just discovered your interesting blog via Hunter Walk’s post about this article. As an aspiring entrepreneur, I look forward to learning a lot from the blog. However, the main reason of my comment is to ask your advice. Currently I’m working on my Ph.D. dissertation focused on success factors of open source software development. Among other sources (FLOSSmole and SourceForge), I plan to use data on open source-related companies from both CrunchBase and AngelList. Do you think that combining these two data sets and selecting a sample from the merged data set will increase representativeness of the sample (despite the CrunchBase bias you mentioned)? Could you recommend other solid sources of data on organizational sponsorship (financial or otherwise) of open source development projects? Nothing insightful to add here other than to say thank you for this awesome post. It really helped me understand some the dynamics of the ad tech industry.